A funny thing happened on the way to 1,000 cable and satellite stations—it became harder to find quality family entertainment on television. Gone are the days of the wonderful world of the Sunday night movie. With unlimited choices, questionable content and repetitive story lines, television programming just isn’t what it used to be. Or, so it would seem. On July 16th, NBC aired a unique program, presented by Walmart, Procter & Gamble and Moms 4 Family TV. 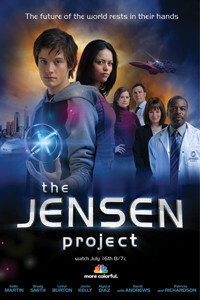 The Jensen Project brings together all of what makes television programming great—compelling plot, superb acting, and appropriate content. The high-tech thriller starts with members of the Thompson family called back into service of the top secret Jensen Project to save the world from an international conspiracy. Along the way the adventure provides positive messages for families and lessons for kids, as well as some interesting product placement and grassroots social marketing. While simple and tasteful messaging from Walmart and P&G supported the programming with limited commercial interruption, the story was marketed the old-fashioned way—through word of mouth. As more and more moms (and dads) around the country caught news of the program, social media buzz took off in anticipation of the wholesome show. In addition to an aggressive •••, the initiative was promoted with Family Movie Night Facebook Group. The program’s cast include Brody Thompson, Alyssa Diaz, Kellie Martin (Life Goes On and ER), Brady Smith, Patricia Richardson (Home Improvement), David Andrews (Apollo 13) and Levar Burton (Yes, that Levar Burton of Roots, PBS Reading Rainbow and Star Trek: The Next Generation).